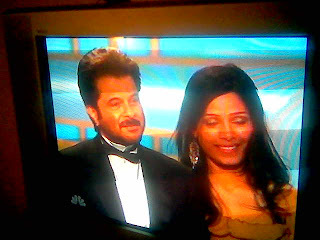 New York Escapades: Slumdog MIllionaire Bags Gloden Globe for Best Picture, Screenplay, Original Score and Director! 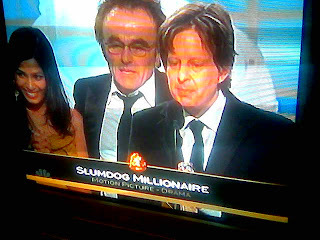 Slumdog MIllionaire Bags Gloden Globe for Best Picture, Screenplay, Original Score and Director! 11.00 pm - SLUMDOG Millionaire wins the TOP prize - Best Picture DRAMA - totally deseving. Some one please contain Anil Kapur. ! 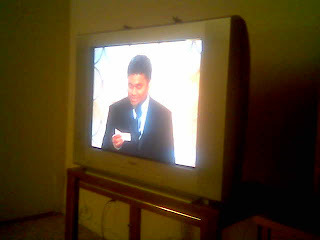 9.15 pm Slumdog Millionaire ( see review) just won the best screenplay award at the Golden Globes. With a big applause. 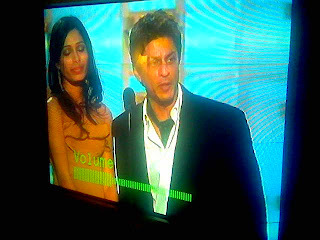 Breaking news that Shahrukh Khan is also at the awards and will be presenting an award (as per SAJA). More to come. 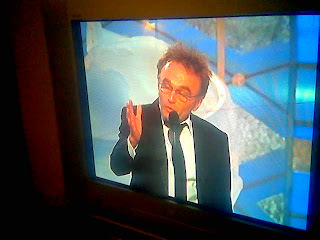 10:20 pm EST- Slumdog gets best director for Danny Boyle and Anil kapur and the other members of the crew erupt ! What a BIIIIIGGGG NIght for Bollywood. Just the start it needs - spielberg gets $500 million to make bollywood/hollywood films and now Slumdog $$ shows how to do it. Also Awesome to see Micky Rourke win the Best Actor for Wrestler, very touching and sad movie but brilliant made.